mmsonline.com October 2017 MMS 91 FEATURE it from roughing tombstone to rotary-table tomb- stone. It does, however, enable taking full advan- tage of the five-axis machine's capabilities. "It just moves smoother, and you get really nice blends," Mr. Anderson says about the MU-6300V. Overall, a cylinder head can be produced in about 13 total hours of cycle time (eight hours of which is lights-out roughing), versus 18 hours on the VMCs. Although improvements like these are rooted in new machine tool configurations and the "3D thinking" they facilitate, Mr. Warga empha- sizes the impor tance of carefully considering every process input. CAM software simulation, for instance, is just as important on the five-axis machine as the turn-mill. The right cutting tool can go a long way as well, as was the case when machining the center hole of the supercharger bearing housing. In that operation, replacing a boring bar with an internally damped model from Sandvik Coromant's Silent Tools line eliminated the need to balance out forces with a hose clamp. 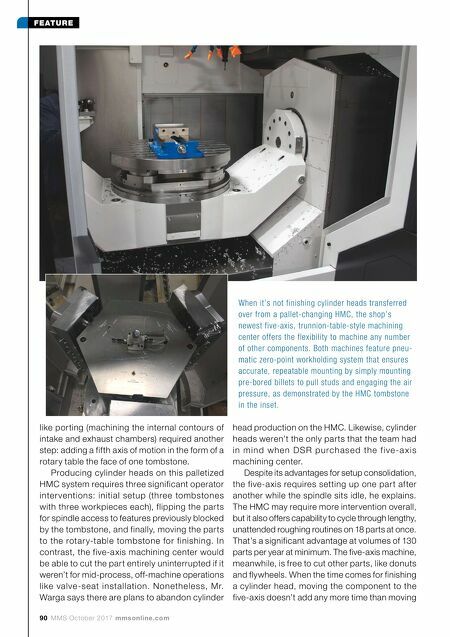 As for workholding, Big Kaiser's Unilock Ergo 138 zero-point chucks have made a significant difference in cylinder head finishing operations. On the older VMCs, operators had to "wrestle" the parts into position and attach various bolts and clamps, Mr. Anderson says. Instead, the shop now machines precision bores into the raw billets to accommodate the Ergo pull studs. As a result, clamping is faster, easier and more consistent. The MU-6300V five-axis and the MA-600 HMC's rotary-table tombstone both employ this work- holding. "You slap it on there, hit the air and it clamps it—there's no indicating the par ts or anything," he says. ON-SITE SUPPORT These are just a few examples of process improve- ments at an organization that has changed a great Effective machining requires attention to every process element. Designed specifically for aluminum, this brad-point Corodrill 860 from Sandvik Coromant features through-the-tool coolant capability that eliminated the need for peck drilling to clear chips. Whereas the old drill ran at 32 ipm and 4,000 rpm, this model runs at 100 ipm and 4,851 rpm. deal in a relatively short period of time. At the root of this change is a drive to be taken seriously not only as a race team, but also as a manufacturing entity, and a modern, sophisticated one at that. The word is spreading, too, particularly in the wake of long-term technical partner and tooling supplier Sandvik Coromant literally moving into the facility in Februar y. Separated from DSR's shop floor by glass windows and doors, the sup- plier's new technical and training center is one of its three major locations in the U.S. It serves as a training, demonstration and process engineering site for the company's automotive customers, often using DSR's own projects and the experi- ence of the racing organization's technical team to illustrate important concepts. 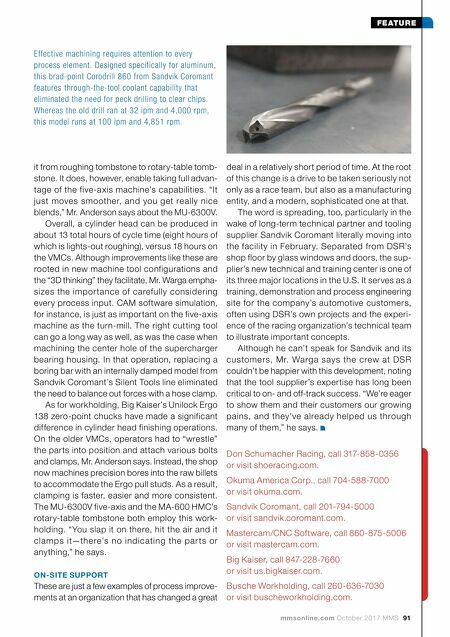 Although he can't speak for Sandvik and its customers, Mr. Warga says the crew at DSR couldn't be happier with this development, noting that the tool supplier's expertise has long been critical to on- and off-track success. "We're eager to show them and their customers our growing pains, and they've already helped us through many of them," he says. Don Schumacher Racing, call 317-858-0356 or visit shoeracing.com. Okuma America Corp., call 704-588-7000 or visit okuma.com. Sandvik Coromant, call 201-794-5000 or visit sandvik.coromant.com. Mastercam/CNC Software, call 860-875-5006 or visit mastercam.com. Big Kaiser, call 847-228-7660 or visit us.bigkaiser.com. Busche Workholding, call 260-636-7030 or visit buscheworkholding.com.